Central Jersey Wound Treatment Center in Freehold, New Jersey, has received accreditation from the Undersea and Hyperbaric Medical Society (UHMS). 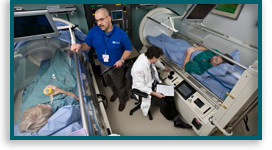 The outpatient treatment center operates two monoplace hyperbaric chambers and is part of the CentraState Healthcare System. Learn more about facility accreditation in our UHMS profile and on the UHMS website.